Napa Valley Wine Train discrimination: Another passenger thinks she was discriminated against. 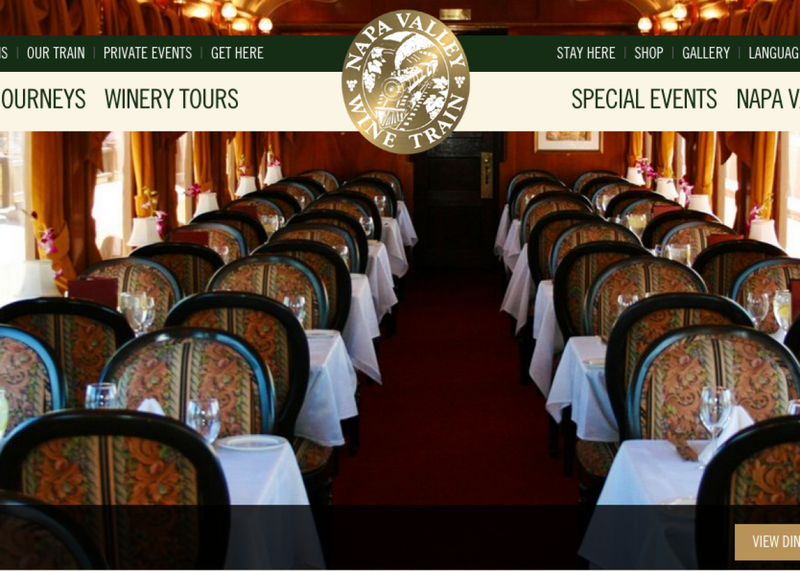 The Napa Valley Wine Train’s home page. Another woman has accused the Napa Valley Wine Train of racial bias for threatening to remove her party from the train after a noise complaint made against them in April, even as the company has apologized for a similar incident on Saturday and said it didn’t reflect its values. The latest report comes after the removal of a group of mostly black women from the train following a similar complaint against them, the difference in this second case being that the group was only threatened with removal and not actually ultimately removed. Norma Ruiz, a graduate student in the University of California–San Francisco’s nursing program, was celebrating her 28th birthday in April when a patron approached her party of 10 people to say that they were being annoying and loud. “We were kind of taken by surprise because we were just celebrating my birthday having normal conversation,” Ruiz told me. A waiter told her group to continue their celebration and they moved to the dining car on their own, she said. Then a woman from the train company approached their party, which at this point had quieted down to below the noise level of the dining car, and told them if they didn’t “control [their] level of noise” they would be kicked off the train. “We were not making noise, we felt very uncomfortable the way we were being approached and [they were] embarrassing our group in front of everyone,” Ruiz says. Ruiz described the group as being made up of “all Latino individuals,” the majority of whom were local University of California–Berkeley graduates. She now sees the incident as one of racial bias. Over the weekend, a group of black women were kicked off of the train after a noise complaint, raising hackles on social media and questions about prejudice. The company’s CEO, Anthony Giaccio, has since apologized personally to Lisa Johnson, the woman who reported the incident occurring to her and her book club, according to a spokesman for the company. “The Napa Valley Wine Train is open to anybody of any persuasion, any color, any day of the week,” crisis communications specialist Sam Singer told me, speaking for the company. When I asked Singer about the incident with Ruiz, he said that he didn’t know anything about it but that the company has to remove parties of “all different races” from the train or ask them to leave about once a month “because of behavior that affects the experience of other passengers.” Singer said the company’s normal policy was to move passengers to other cars when there’s a conflict over noise, but they couldn’t do that with the book club because the train was sold-out. Ruiz, however, says her party had not only moved to the dining car when they were threatened with removal, but explicitly asked if they could be placed in an open car and were denied. Ruiz had decided to have her birthday there after taking the train previously with her parents and boyfriend and having seen a “large group of white girls celebrating a birthday or a bachelorette” and not experiencing any problems. The group was making a similar amount of noise as Ruiz’s group. “I remember them having fun,” she said. “I never saw anyone approach them. Ruiz’s description of the white women not being approached, her own experience, the experience of the book club, and a series of Yelp reviews in which similar events seemed to unfold differently raise further questions. Yale sociology professor Elijah Anderson has described how “white spaces” are “overwhelmingly white neighborhoods, schools, workplaces, restaurants, and other public spaces” where people of color can feel a burden to prove their belonging. “Certainly a wine train in Napa Valley would be considered a ‘white space,’ ” says University of California–Berkeley associate professor Nikki Jones, who has discussed the topic on This American Life. “One of the things you hear again and again from women of color, including in spaces like this, in retail settings, is that there’s a hyper-visibility,” Jones told me. “They stand out in particular places. And they’re policed.” The policing can come from actual police (cops greeted the book club when they were removed from the train), from authorities within a space (like train employees), or from fellow patrons of that space (like complaining train passengers). The way Ruiz described her experience seems consistent with this description. “It’s more of an environment on the train and something they need to work out,” she said. Johnson had recommended that the Napa Valley Wine Train “give sensitivity training to their staff immediately.” Singer told me they were taking her up on that. Correction, Aug. 25, 12:17 p.m.: A home page headline for this post originally stated that the passengers were kicked off the train. Update, Aug. 25, 2015, 11:30 a.m.: This post has been updated to explicitly say Ruiz’s group was not removed, but only threatened with removal.